Bo and Wang new BFFs? Recently during a routine exchange between Guangdong and Chongqing officials, Wang Yang and Bo Xilai, the party heads of the respective regions, started lavishing over-the-top praise on each other. Bo went on about how Wang “laid the foundations” for the present conditions of Chongqing while Wang talked about a special Chongqing tree he keeps – which reminds him of the municipality and the progress it’s making. This seemed especially odd given that the two men are obvious rivals for the Politburo Standing Committee (PSC) and have made subtle public jabs at one another in recent months. Russell Leigh Moses from Wall Street Journal ran a piece explaining the love fest as a prompt from Beijing to quell any public impression of an inner-party rivalry. He speculated that the two men recited their scripts reluctantly, since they still see themselves very much as competitors. I’m guessing it was something Beijing wanted, but I’ll venture to say perhaps it wasn’t done reluctantly by either side. For months foreign media has been speculating on this rivalry and what direction the PSC (and ergo China) might go. 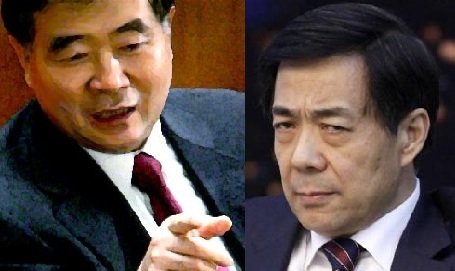 Bo Xilai has become fairly famous through his red campaigns and awareness is growing of his and Wang’s competing models – especially among intellectuals. This awareness has perhaps become great enough that putting either one on the PSC would create expectations the greater party doesn’t want to commit to. With Bo, people might expect tough egalitarian measures, or with Wang, greater freedoms. Putting either on now would be a strong a signal of intent to head in one direction or the other. If that’s the case, it’s either both or neither for the PSC. And putting both on is risky. Having such a public disparity of ideology sitting in the top nine could suggest a break in the unified front the party tries to convey at all times. Radically divergent views between hardliners led by Li Peng and progressives by Zhao Ziyang in 1989 gave protesters a whiff of weakness that they seized upon. That’s hardly a time bomb the party wants to risk planting during this sensitive era. So perhaps that’s what’s behind the new affections. Bo and Wang are trying to hold hands and show they can work together without stirring up the pot. They’d rather both make the cut than neither of them. But both men have fallen from their pinnacles. Bo peaked this past summer amid the 90th anniversary of the CCP where he thrived in the greater attempt to reinforce party legitimacy. Since then he’s slid to wild card status after many compared him with Maoism and wondered if the Chongqing model could work on a nationwide scale. So Wang took the spotlight; but with the events that have unfolded in Wukan this week under his watch, it’s hard to imagine he has much of a shot left. So it looks increasingly likely that neither man will be tapped for promotion. But who knows what could happen in the months ahead. Knowing Bo a lot more than the Quangdong competition, this is a good read. I can’t respect a man who drives the latest version of the Jaguar. OMG, that is one crap motor from the UK . Little wonder senior cadres went for superior German driving technology. And then there is young Bo’s recent trash celebrity…. expensive Italian driving style. Automobiles tell us a lot about heirarchy and status in the Middle Kingdom, or any society for that matter. Really, a society seriously organised around automobile status like China has no future. Looking thru a car window in air-conditioned comfort has a certain disconnected vibe to it. I always preferred the vibe emanating from the Hongqi. But those unheated backseats left the driver in comfort and the passengers freezing. Bob, although they were your good frdnies and you have been in China for a long time, I wonder if they still adjusted their conversation in front of you because you are not Chinese. They might have had a desire, conscious or subconscious, to correct the misconceptions they think Westerners have about them, and see you as a proxy for their abstract notion of “Westerners.” Or they might still feel some patriotic duty to talk positively about China in front of non-Chinese. I’ve noticed that when some Chinese have something they really want to tell “the American people,” they will tell me, because I’m one of the only Americans they know. I know I do this too sometimes with my Chinese frdnies when I really want to communicate something to “Chinese people” in the abstract. Also, I have had Chinese frdnies tell me they feel guilty after criticizing China in front of me. This is even after knowing that I’m ethnically half-Chinese and that I know much more about China than the average American. The identity of the listener often affects what the speaker will say, and this is true for all people, not only Chinese. And as I mentioned, the effect is often subconscious. Bo Xilai is what Disraeli would have called “a great man in a hurry”. It is very difficult to believe that such an ambitious character could sit easily in the politburo whilst others wield the power of state. How do Chinese see North Korea?